WHILE THOSE WHO ARE INDIGENOUS to Turtle Island (North America) have long been active stewards of the land, we may currently be witnessing a wider reclamation of Indigeneity in its practices and politics, and most definitely, in the visibility of Native American environmental activism. Queering this push for environmental justice are Two Spirits — people who are believed to possess both feminine and masculine spirits, and who play sacred roles in Native communities. 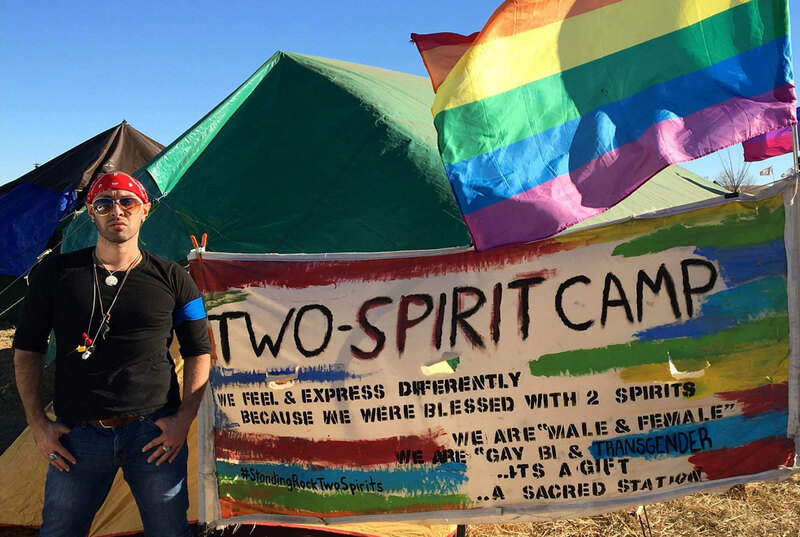 Two Spirit activism has provably benefited an environmental movement struggling to respond to the acting United States administration’s multiple attacks on the sovereignty of both land and body — subjects that settler colonialism might deem separate — and to confront its own whiteness and heteronormativity. This Two Spirit resistance to environmental degradation was more visible than ever at Standing Rock, where Natives and allies gathered in 2016 to oppose the Dakota Access pipeline running near reservation land and through sacred sites in North Dakota. The protests garnered international attention, putting many eyes on the Oceti Sakowin Camp, which hosted water protectors on the edge of the Oglala Sioux reservation. Within Oceti Sakowin, Two Spirits set up Winyan Camp, a safe space for women, children, and Two Spirits. While the settler gaze has moved away from the Oglala Sioux with the news cycle, Two Spirits remain on the frontlines of environmental and climate justice struggles across Turtle Island. “Now,” says Two Spirit activist Zephyr Elise, who oversaw Winyan Camp for four months, “we are being reactivated like an immune response to the viruses of greed, capitalism, [and] occupation that threaten our Mother.” From building homesteads for homeless Two Spirit youth to opposing tar sands developments, many within the community have noticed an uptick in embracing of the Two Spirit title. These roles were threatened when European settlers first colonized North America. “There was an active suppression by colonial states of Indigenous sexuality and gender roles through violent means, particularly towards gender and sexual expressions that clashed with Western concepts,” says Gwen Benaway, a bisexual poet and trans woman of Anishinaabe and Métis descent. Many Nations had their Two Spirit traditions erased. This trauma is ongoing. Zephyr Elise is currently fighting with the Salish Sea Nations of the Pacific Northwest who are resisting a proposed liquefied natural gas storage facility on an estuary in Tacoma, Washington, putting their bodies on the line in the process. “[We’re] out here saying no to more shipping of tar sands into the Salish Sea,” Elise says. They have been arrested multiple times in nonviolent direct actions, including at Oceti Sakowin, where they developed post-concussion syndrome from sustaining repeated brain trauma. Bani Amor is a queer travel writer whose work has appeared in CNN Travel, Teen Vogue, and in the anthologies Outside The XY: Queer Black and Brown Masculinity, and the upcoming Where We Stand: Brown and Black Voices Speak The Earth.